When working a horse, it’s important to always practice safety as even a slight misstep or miscue can lead to serious injury – and even death! With June recognized as National Safety Month, here are few tips to keep yourself safe when handling a horse. 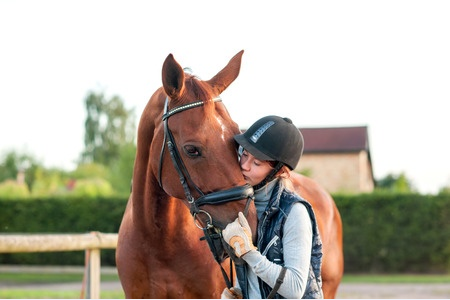 No matter what you are doing with the horse, when you are not riding it, the safest place to be is either very close – 5 inches from them – or 5 feet away, says Hoofbeats & Ink. The reason is that when you are too close or too far, you’re outside of the kicking range of a horse, meaning that you’re much less at risk of being injured. If you are grooming your horse and you are walking around their head, try and be a few feet in front of their faces. A horse’s blind spots are behind them and in front of them, so by standing a few feet away, they will be able to see you and won’t be afraid. When grooming them in the back, keep a hand on their hindquarters so they know you’re there and to prevent them from being scared of what they can’t see. When a horse does this, they are damaging the respect of your relationship. If a horse does this, they are invading your personal space and not showing you deference and respect. You can break them of this habit by backing away up from them. The horse might then begin to nudge your back or side, but if they do, simply stick your elbow out for them to hit instead. Make sure to maintain control of your horse while leading him or her to the riding area. Hold one hand right below the halter and keep the other on the lead rope, with excess coiled in hand instead of around your arm. That way, if your horse bolts, the rope will pull from your hand and not your wrist or arm. Don’t keep treats in your pocket, as the horse will be able to smell them and expect you to give him or her some. You should also avoid allowing your horse to eat out of your hands. Instead, place the treats in their feed bucket so that they don’t associate your hand with rewards. Of course, you also want to keep your horse safe from the elements, and at Deer Creek Structures, we can help. We offer a variety of quality portable run-in sheds and horse barns that will keep them dry, comfortable and safe. To learn more, check out our inventory online now, or call us today at 254-546-2276.